1. Place the honeycomb stencil onto the notebook. 2. Use a palette knife to mix Modeling Paste with a small amount of Black Gesso. This will help to color the Modeling Paste, which dries opaque. Use a palette knife or silicone tool to spred this Modeling Paste/Gesso mixture over the stencil. You will be applying it almost like spreading butter. 3. Dry the honeycomb with a heat gun. 4. Use a brush and apply black gesso over the front and back covers of the notebook. Dry. 5. 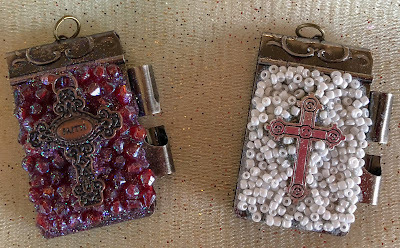 You’ll use blue-toned mica sprays to create a sky effect on the cover of the book. Start by spraying some Bucaneer Bay Blue, which also contains brown walnut stain. Then move onto glittery blue sprays. such as Sassy Saphire, Texas Bluebonnets, and Delphenium Turquoise. Pause between application of a spray; dry it; and then look at it before spraying another color. You can lightly use Bashful Blue as the final color to lighten the look. Dry. 6. Now let’s concentrate on the honeycomb pattern. Apply a gold mica spray to ONLY the honeycomb area. To intensify the gold, use the Solar Gold with applicator top to add color to each individual honeycomb. Allow to dry or gently force dry with heat gun. 7. While waiting for any of the project to dry, you can paint the moulded flowers with metallic paints (Silks). Pick harmonizing colors. After the paint dries, you will spritz on one of the Moon Shadow Mists, which contain glittery mica powder and walnut ink. This will create dimension on the flower so that the paint doesn’t appear flat. 8. You need to spray seal the book before you proceed to gluing on elements. 9. Apply diamond glitter to the wings of the honey bee and gold glitter to its body. 10. Time to add the embellishments! First of all, lay everything onto the front of the book to see where you want to put the pieces. Refer to the sample as needed. 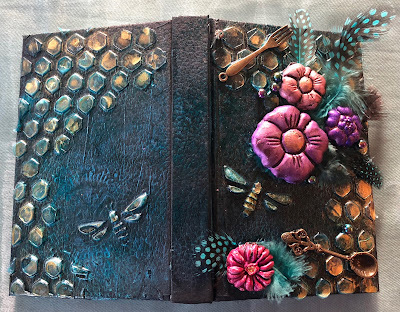 Use Heavy Body Gel on the flowers, tuck the feathers behind the flowers, and stick flowers onto the book. Add the 2 bronze mini utensils. You also can add the holographic blue beads, as shown in the sample. 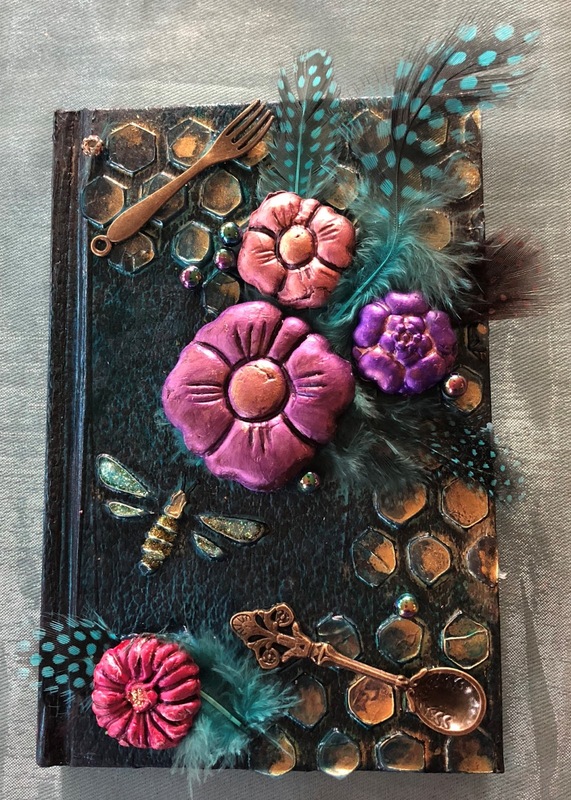 Let’s transform a plain black notebook. 1. 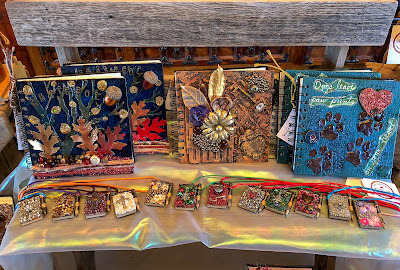 Cut a piece of burlap or cardboard and use white glue to adhere it to the notebook cover. 2. Brush black gesso onto the front and back of the notebook. Dry. 3. Use a stencil and a silicone brush or palette knife to spread on a gel medium or modeling paste. Dry. 4. Brush on black gesso. Dry. 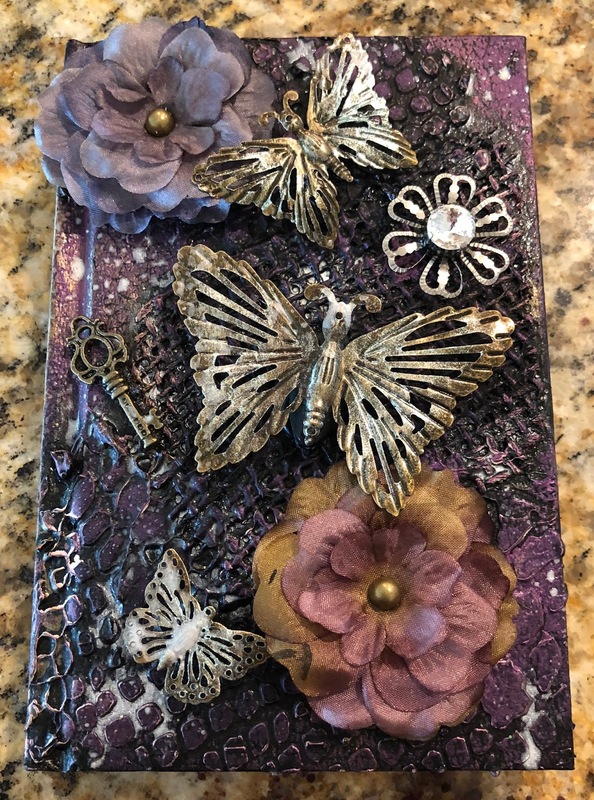 I mostly used purple-toned products to color the notebook, but you can use whatever color scheme you’d like. 5. Use a combination of glittery mica sprays and metallic paints to color the front and back covers. You can begin by painting on Snap Dragon or Royal Orchid Silks. After that dries, spray two or three of these colors: Buccaneer Bay Blue, Smoky Sapphire, Bluebeard Blue Violet, Hi Maintenance Magenta, and Witch’s Potion Purple. Pause between application of a spray; dry it; and then look at it before spraying another color. You can add some pink, such as Pink Grapefruit and Plumeria. 6. Now use your fingertips to Art Alchemy Amethyst Magic. You also can use a touch of Opal Magic. 7. You need to spray seal the book before you proceed to gluing on elements. 8. Use Heavy Body Gel to stick on metal butterflies. To create height, you can use buttons to lift the butterflies. Add flowers, metals and jewels, if desired. Does my nose look big? Have you ever tried brass embossing plates? 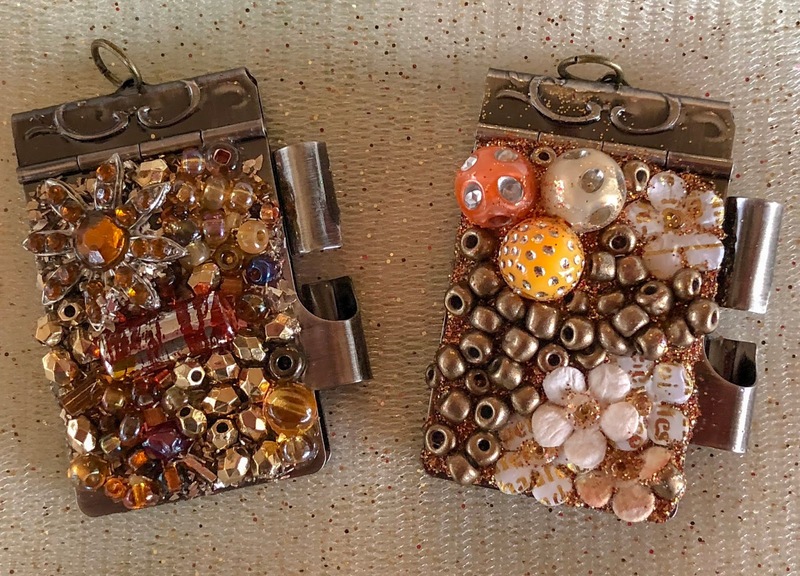 A number of years ago, one of my Canadian crafty friends gave me a set of gift tags. 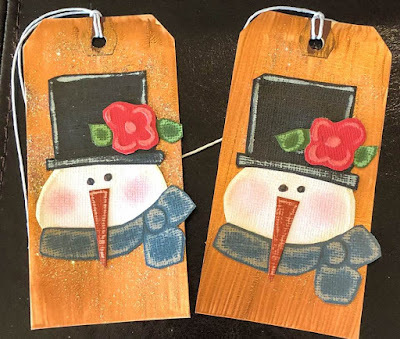 I'd never seen so much detail and cuteness in an handmade tag, and she told me about Lasting Impressions, which makes a wide range of brass stencils or embossing plates. 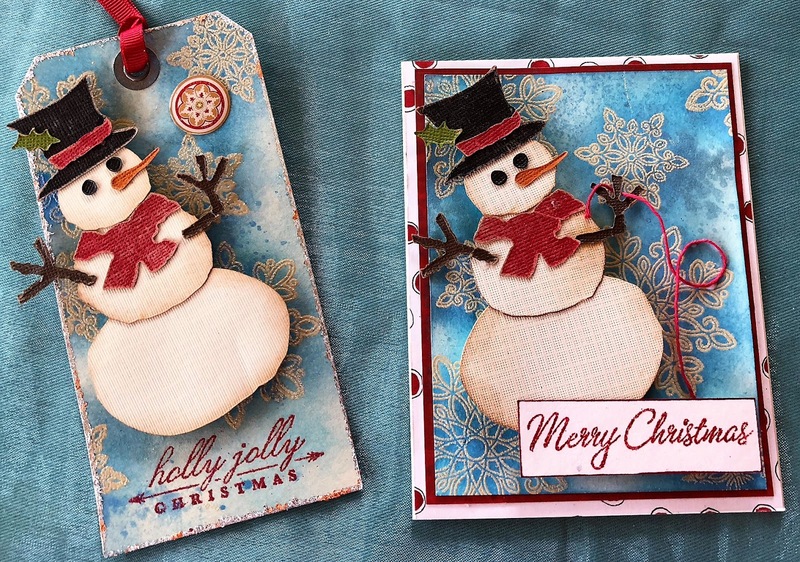 Here are some gift tags and a box that I made with one of their cute snowmen. 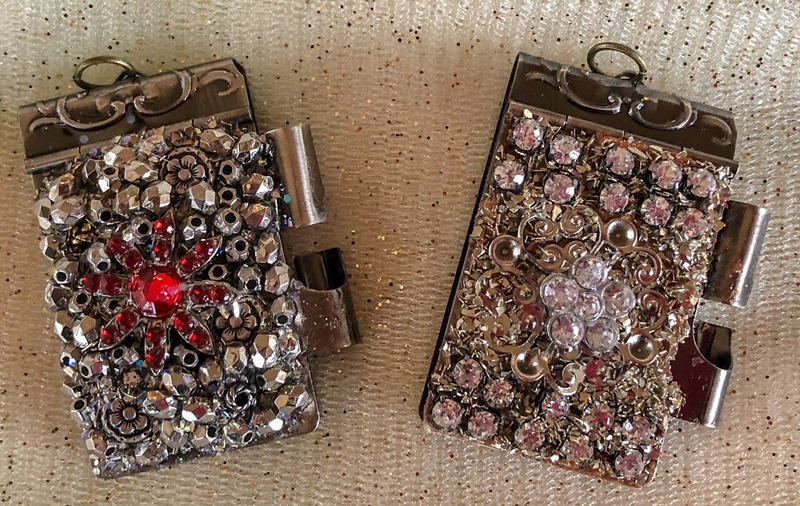 There's helpful information on the Lasting Impressions site that explains the "how to" of hand embossing. This Sizzix snowman has some serious attitude! I made both tags and cards using this cute and whimsical fellow! 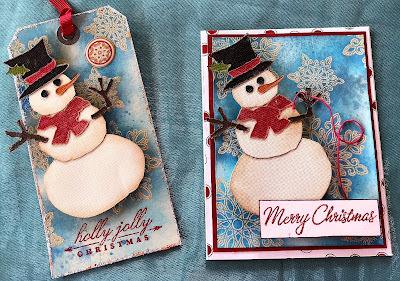 The background was made by stamping and embossing snowflakes and using a variety of Tim Holtz distress inks. 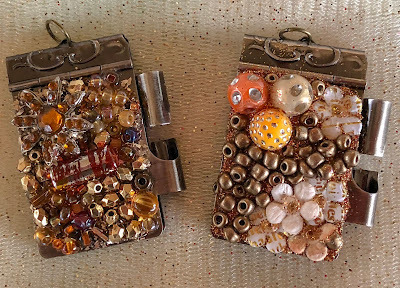 These embellished "dance card" pendant necklaces were my favorite mixed-media art project of this past autumn. They have miniature pencils that lock the tiny notebook in place. With a puppy keeping my hands full, I haven't had much time in the art studio lately. But I did manage to make a card and schedule a workshop to make this card at my church. Yes, I'm already making Christmas cards. We sold out of almost all of our Christmas cards at our King of Glory Lutheran Church Christmas bazaar last November, so we are starting over with new products. 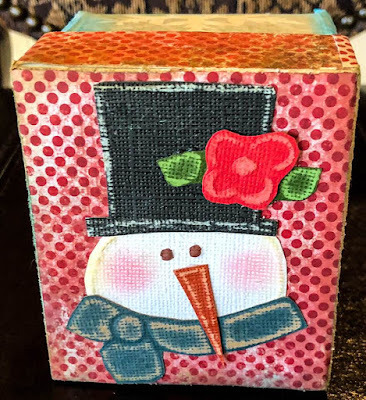 This card features an old Stampin' Up stamp set, "Roses in Winter," and a newer set, "Reason for the Season." I'm not sure what Tully will do when we are no longer in snow season because this dog LOVES the snow! Here are a couple of videos of him playing in the white stuff. Hubby Niall even made a "snow mountain" for him to play on. 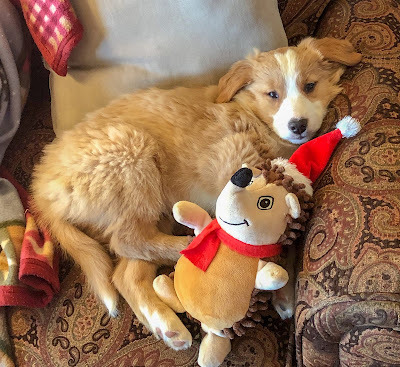 Welcome to our new English Shepherd puppy, Tully McTuck! The top photo is when we brought him home at the end of November at 8 weeks. The new photo is from yesterday. He is now 30 pounds and 4 1/2 months old with tons of energy! I love the ear action! 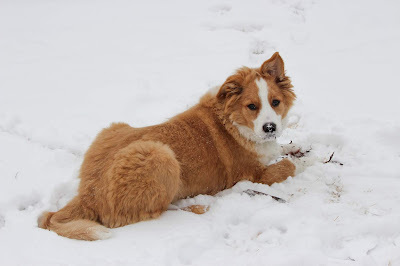 We had a bit of snow yesterday, and he enjoyed scampering around in the frigid white stuff. He particularly liked digging mulch and sticks out of the flower beds. 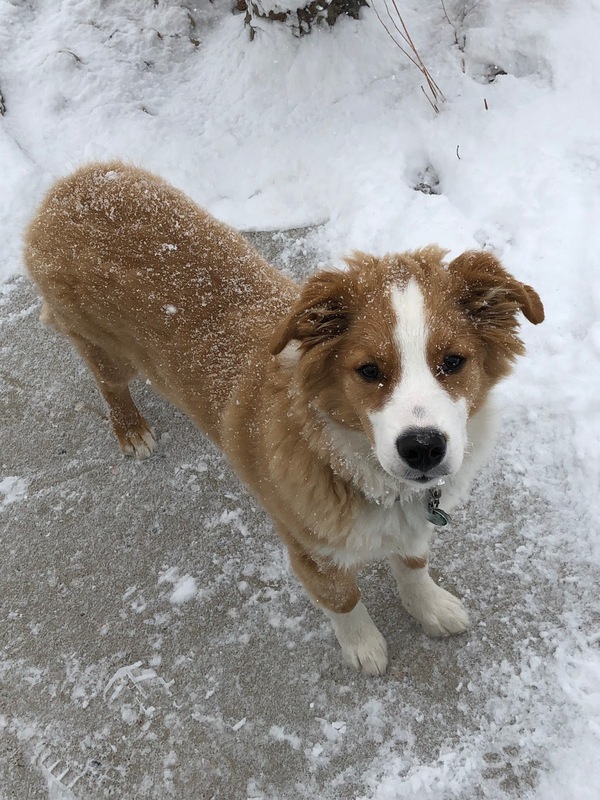 He's wanting a snowy romp and walk today, but we started out at -6 degrees F. Too cold for little paw pads! We're trying to keep him amused with ball and fetch indoors. A puppy needs to play!